Classic modes of operation such as CBC only provide guarantees over the confidentiality of the message but not over its integrity. In other words, they don’t allow the receiver to establish if the ciphertext was modified in transit or if it really originates from a certain source. For that reason, classic modes of operation have been often paired with a MAC primitive (such as Crypto.Hash.HMAC), but the combination is not always straightforward, efficient or secure. 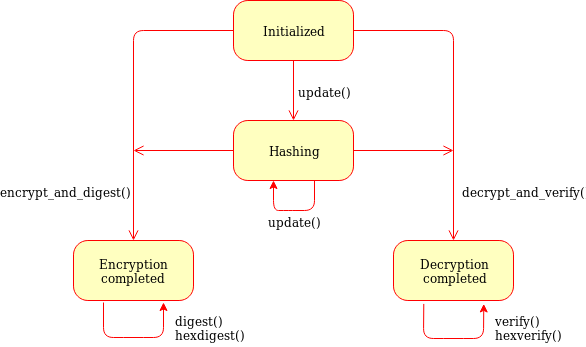 Recently, new modes of operations (AEAD, for Authenticated Encryption with Associated Data) have been designed to combine encryption and authentication into a single, efficient primitive. Optionally, some part of the message can also be left in the clear (non-confidential associated data, such as headers), while the whole message remains fully authenticated. In addition to the ciphertext and a nonce (or IV - Initialization Vector), AEAD modes require the additional delivery of a MAC tag. Authenticate those parts of the message that get delivered as is, without any encryption (like headers). It is similar to the update() method of a MAC object. Note that all data passed to encrypt() and decrypt() get automatically authenticated already. Create the final authentication tag (MAC tag) for a message. Equivalent to digest(), with the output encoded in hexadecimal. Check if the provided authentication tag (MAC tag) is valid, that is, if the message has been decrypted using the right key and if no modification has taken place in transit. ValueError – if the MAC tag is not valid, that is, if the entire message should not be trusted. Same as verify() but accepts the MAC tag encoded as an hexadecimal string. Perform encrypt() and digest() in one go. output (bytes/bytearray/memoryview) – the pre-allocated buffer where the ciphertext must be stored (as opposed to being returned). The first item becomes None when the output parameter specified a location for the result. Perform decrypt() and verify() in one go. output (bytes/bytearray/memoryview) – the pre-allocated buffer where the plaintext must be stored (as opposed to being returned). Counter with CBC-MAC, defined in RFC3610 or NIST SP 800-38C. It only works with ciphers having block size 128 bits (like AES). Create a new CCM object, using <algorithm> as the base block cipher. nonce (bytes) – the value of the fixed nonce. It must be unique for the combination message/key. For AES, its length varies from 7 to 13 bytes. The longer the nonce, the smaller the allowed message size (with a nonce of 13 bytes, the message cannot exceed 64KB). If not present, the library creates a 11 bytes random nonce (the maximum message size is 8GB). mac_len (integer) – the desired length of the MAC tag (default if not present: 16 bytes). msg_len (integer) – pre-declaration of the length of the message to encipher. 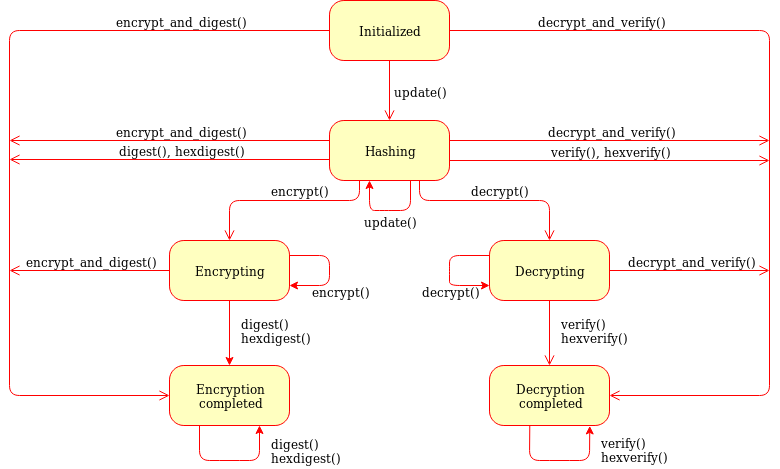 If not specified, encrypt() and decrypt() can only be called once. assoc_len (integer) – pre-declaration of the length of the associated data. If not specified, some extra buffering will take place internally. The cipher object has a read-only attribute nonce. An AEAD mode designed for NIST by Bellare, Rogaway, and Wagner in 2003. The new() function at the module level under Crypto.Cipher instantiates a new EAX cipher object for the relevant base algorithm. Create a new EAX object, using <algorithm> as the base block cipher. nonce (bytes) – the value of the fixed nonce. It must be unique for the combination message/key. If not present, the library creates a random nonce (16 bytes long for AES). mac_len (integer) – the desired length of the MAC tag (default if not present: the cipher’s block size, 16 bytes for AES). Galois/Counter Mode, defined in NIST SP 800-38D. It only works in combination with a 128 bits cipher like AES. The new() function at the module level under Crypto.Cipher instantiates a new GCM cipher object for the relevant base algorithm. Create a new GCM object, using <algorithm> as the base block cipher. mac_len (integer) – the desired length of the MAC tag, from 4 to 16 bytes (default: 16). Synthetic Initialization Vector (SIV), defined in RFC5297. It only works with ciphers with a block size of 128 bits (like AES). Although less efficient than other modes, SIV is nonce misuse-resistant: accidental reuse of the nonce does not jeopardize the security as it happens with CCM or GCM. As a matter of fact, operating without a nonce is not an error per se: the cipher simply becomes deterministic. In other words, a message gets always encrypted into the same ciphertext. The new() function at the module level under Crypto.Cipher instantiates a new SIV cipher object for the relevant base algorithm. Create a new SIV object, using <algorithm> as the base block cipher. key (bytes) – the cryptographic key; it must be twice the size of the key required by the underlying cipher (e.g. 32 bytes for AES-128). nonce (bytes) – the value of the fixed nonce. It must be unique for the combination message/key. If not present, the encryption will be deterministic. If the nonce parameter was provided to new(), the resulting cipher object has a read-only attribute nonce. The length of the key passed to new() must be twice as required by the underlying block cipher (e.g. 32 bytes for AES-128). Offset CodeBook mode, a cipher designed by Rogaway and specified in RFC7253 (more specifically, this module implements the last variant, OCB3). It only works in combination with a 128 bits cipher like AES. OCB is patented in USA but free licenses exist for software implementations meant for non-military purposes and open source. The new() function at the module level under Crypto.Cipher instantiates a new OCB cipher object for the relevant base algorithm. Create a new OCB object, using <algorithm> as the base block cipher. nonce (bytes) – the value of the fixed nonce, wuth length between 1 and 15 bytes. It must be unique for the combination message/key. If not present, the library creates a 15 bytes random nonce.